At some point during the evening White doused Green with a pan of boiling grits while he was showering causing severe burns on Green's back stomach and arms. Following the performance Mitchell asked Al to sign with his Hi Records label to which Al agreed. 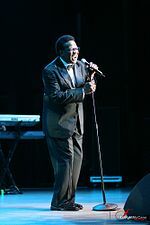 While in high school Al formed a vocal group called Al Greene & The Creations. Inducted to the Rock and Roll Hall of Fame in 1995 Green was referred to on the museum's site as being "one of the most gifted purveyors of soul music". 66.